illy's distinctive blend of fine 100% Arabica coffees with a smooth, rich and full-bodied taste. The medium blend features a rich and balanced taste with notes of caramel and chocolate. illy Espresso is finely ground to provide optimal extraction with espresso machines that accept ground, tamped coffee. illy blend espresso features a thick, velvety and long lasting crema. Sourced from the top 1% of Arabica beans grown worldwide. 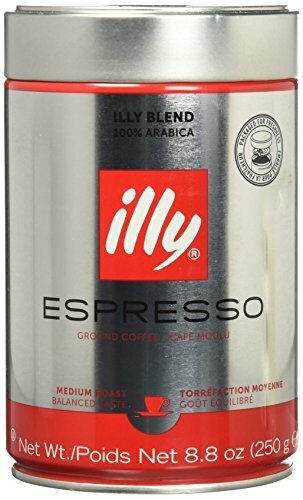 Our unique pressurized coffee packaging preserves the flavor and complexity of the illy blend while enhancing the coffee's aroma and ensuring optimal freshness. Each order comes with 1 pressurized 8.8oz can of fine ground Espresso coffee.